Sweet. Smoky. Spicy. Salty. These are some of my absolute favorite flavor words. Mmm, my mouth is watering just typing them! This recipe for a little cocktail nibble hits all the right notes. If you ever come to my apartment for a party or a holiday meal expect to see these nuts as part of my hors d’oeuvres spread. Sweet, smoky, spicy, and salty all at once I find them virtually irresistible. It takes every ounce of my willpower to actually save these nuts for my guests. Feel free to halve this recipe if you’re expecting just a few people. 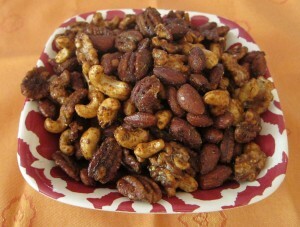 But since the nuts will keep in an airtight container for a few days you might as well make the whole batch. You’ll thank yourself later. 2. In a large bowl whisk together the brown sugar, cumin, paprika, thyme, salt, and cayenne pepper. 3. In another large bowl whisk together the egg whites and water until the whites are foamy. Add the nuts to the egg whites and stir to coat. Transfer the nuts to a colander, letting the excess egg drain away. 4. Add the nuts to the spice mixture and stir to coat. Spread the nuts in a single layer on the two baking sheets. Bake for 30 minutes. 5. Stir the nuts. Reduce the oven temperature to 200° and continue to bake for another 30 minutes. 6. 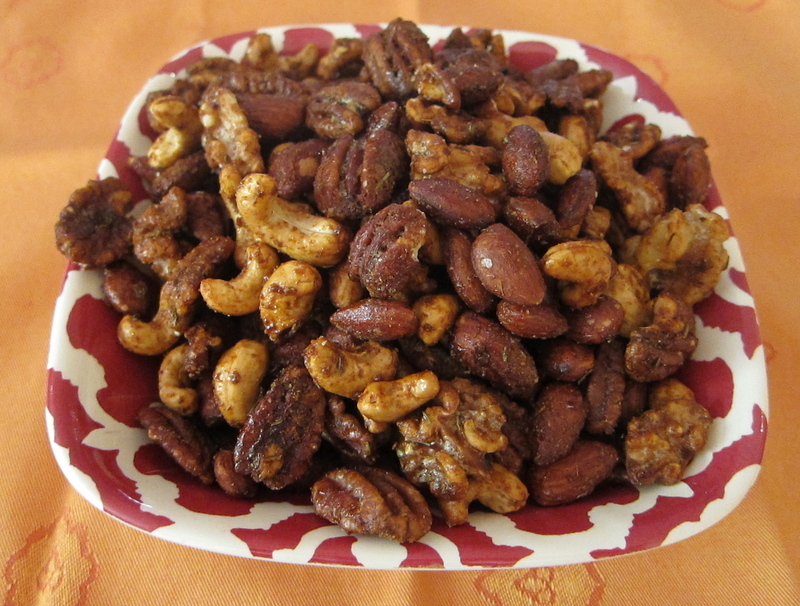 Let the nuts cool for at least 20 minutes or cool and store in an airtight container for up to five days. This entry was posted in Blog and tagged hors d'oeuvres, Recipe, snacks. Bookmark the permalink. I never would have thought of making my own party nuts! I will try it next time we have people over. Sounds delicious! These sound wonderful. It would make a great Christmas gift for the neighbors.